Siraj Lubega is the name, he does his thing from Zambia. It should be recalled that he was one of the folks that put a lot of cash in the late Ivan Semwanga's grave. 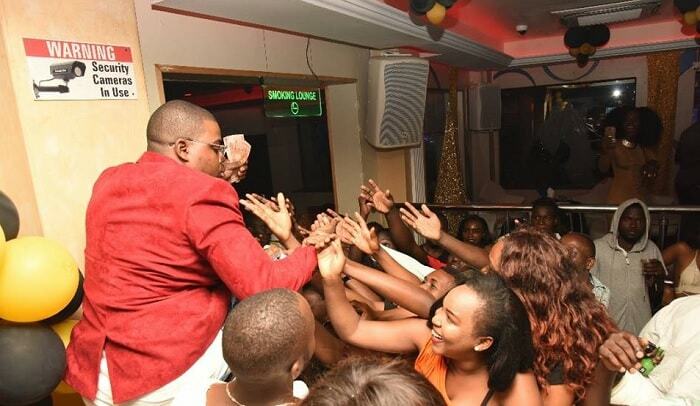 December has come to an end with lots of parties, but none of them came close to what Ivan Semwanga used to do, Zari's White Party tried when it comes to numbers of patrons that came through. The rest of the parties held were way below Hamisa Mobetto's in terms of attendance. Back to Lubega. He prefers to be called Don Bahat Lubega, and he claims to be single though not searching. He wants to be the next Ivan Semwanga and by this he has decided to emulate him in every way possible. 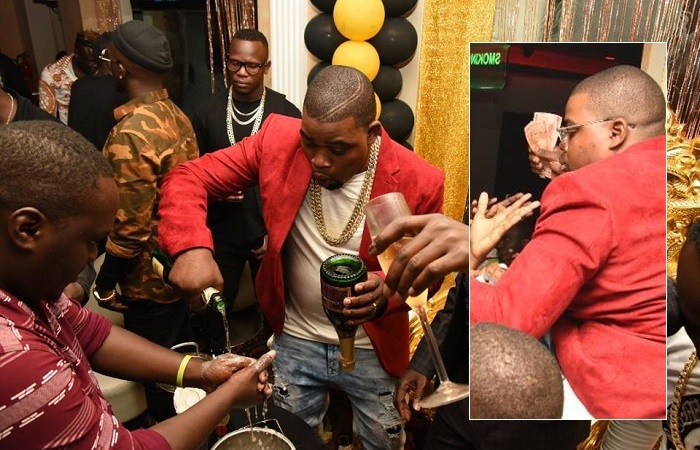 He has literally taken on every swag move that Ivan used to do including pouring champagne at the bottom of the bottle and taking it from there, he's been reminded that there can only be one Ivan Semwanga. He's also been told to try and get a hot baby mama like Zari if he is to fit in his shoes. At his party that was also fairly attended, he had come with Chameleone who unfortunately was not allowed to access the inside venue due to a one year ban that he is about to complete. Inside Guvnor on Dec 28, Bahat who moves around in a hired black Lincoln Limousine went on to dish out money just like Ivan (in Moze Radio's voice), but he still could not measure up. One person who has tried to overshadow the mark Ivan left is none other than Bryan White, he gave out money in three months that Ivan gave out in four years. All the party organizers this year, ranging from One Million Dollar, Gal Power Party by Don Zella, White N Gold by Boss Mutoto, Money N Fame are all promising fire next year, but for now, they were all average leading many to this conclusion; December can't be the same without Ivan Semwanga, maybe it could have been better had Bryan White not been locked up.